For the rivers of Toronto, see Toronto waterway system. View of the Little Rouge Creek and the Rouge Valley, one of the ravines that make up Toronto's ravine system. The Toronto ravine system is one of the most distinctive features of the geography of Toronto, Ontario, Canada. It is a network of deep ravines that form a large urban forest that runs throughout much of the city. For the most part designated as parkland, the ravines are largely undeveloped. Toronto's slogan: "The city within a park" partially stems from the extensive ravine green space. The ravine system was formed by millennia of rivers and creeks eroding loose soil, deposited throughout the region during the end of the last glacial period. The terrain that the city of Toronto sits on was formed after the end of the last ice age some 12,000 years ago. The glaciers flattened the terrain, and deposited a thick layer of loose sand and soil over the region. Over the millennia, small rivers and creeks eroded this soil cutting deep ravines through what is today the Toronto region. 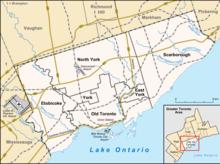 To the north of Toronto is the 1,900-square-kilometre (730 sq mi) Oak Ridges Moraine. The largest ravines are home to the rivers running south from the Moraine to Lake Ontario: the Humber River, the Don River, and the Rouge River. Smaller creeks and streams rise within Toronto from rain and melt water. The Don River is categorized as an underfit river, as it is too small for its relatively steep and broad valley. Despite the dense population of metropolitan Toronto, many of the ravines have been left close to their natural state. The most important reason for this is the danger of flooding. The rivers and streams that flow through the ravines are highly variable. During the late summer, many of the smaller ones will slow to a trickle or even disappear completely. During the spring and after major storms, the creeks often overflow their banks. Every few decades, a massive flooding event will occur where the ravines are almost totally flooded. The most recent such event was in 1954 when Hurricane Hazel arrived. That storm dropped over 12 cm (4.7 in) of rain on the city in a day onto soil that was already waterlogged by a week of rain. In the post-war boom years, several developments had begun to encroach on the ravine lands, and these neighbourhoods were badly damaged by the storm. Whole blocks were washed away and 81 people killed. The damage was most severe along the Humber River, where a part of a street was destroyed completely. This disaster led to an almost complete ban on development in the ravines, and a new Region Conservation Authority was created to maintain them as open spaces. Early settlers quickly discovered that the sandy and gravelly soil of the ravines made them unsuitable for agriculture. They were extensively logged during the nineteenth century, and there are very few trees in the ravines that date to before the end of logging around 1850. The rivers and creeks were also an important source of power for early European settlers, and many mills operated on the rivers in the nineteenth century, with the last closing in 1914. The Don Valley with Prince Edward Viaduct overhead the Don Valley Parkway. As the city grew, the area surrounding the Don River saw the largest transformation amongst the city's ravine systems. Amongst the ravines that run along the city's waterway system, the ravines surrounding the Don Valley, is one of the most transformed. The southern portion of the Don was completely encased in a concrete channel to prevent flooding and allow industry to locate in the area. Along the length of the valley, first the rail lines and then the six-lane Don Valley Parkway were constructed. Today, the industries along the lower Don are gone, and significant efforts are underway to restore the lower Don to a more natural condition. Several smaller ravines have almost completely disappeared due to development and industrial use. Smaller creeks running through the downtown, such as Garrison Creek and Taddle Creek, were almost completely bricked over and today run deep under the modern city centre. These were used as sewers by the early residents of Toronto. Even today, many of Toronto's storm drains empty directly into the ravines. In case of overflow, some parts of the sewer system are also designed to empty into them. Recent decades have seen concerted efforts to protect the ravines, and to restore them to a more natural state. In 2002, the city issued a new bylaw protecting ravine lands. Most of the ravines were long closed off from the city. The road network either bypassed the ravines, or crossed bridges running above them. Many people travelling through the city by private motor vehicle can thus be entirely unaware of the sharp variations in topography. It is only in recent years that a concerted effort has been made to integrate the ravines into a system of paths useful for pedestrians and cyclists. The Humber River Trail is one of several trails in the city that go through the ravine system. A number of the ravines now have paved paths, well maintained bridges, and stairs. Many others do not have such amenities, and the city intends to leave most of these areas unspoilt. The ravines are today popular with hikers and bicyclists, to the extent that erosion and wildlife disruption are becoming a problem in certain areas. While suitable for hiking and cycling, the rivers and creeks running through the ravines are still quite polluted and swimming and wading is inadvisable. There are many dangers for those exploring the ravines. Many areas are very rugged with poor paths and steep cliffs. There are few guardrails or stairs. Waterways are often fast moving and very cold, and can be deadly if one falls in. Poison ivy and nettles are also abundant. While located in the heart of one of North America's largest cities, most of the ravines are deserted most of the time. This does lead to concerns about crime, and women especially are often discouraged from walking through them alone. While crimes do occur, they are not commonplace. A persistent problem is that of illegal dumping of garbage in the ravines. Certain parts of the ravines are also known as gay cruising areas. The ravines are also home to a considerable number of homeless people, some of them living in fairly elaborate temporary structures. In 2001, The Globe and Mail ran a three part series titled "The Outsiders" tracing the life of the homeless residents of the ravines over the course of nearly a year. It won a National Newspaper Award for best feature writing. Map of Toronto and its waterway system. Most of the ravine system is situated around these waterways. There are four major groups of ravines, and many smaller groups scattered throughout the city. In the west, the Humber River forms the eastern border of the former city of Etobicoke. It has several creeks feeding it, most prominently Black Creek, which have carved ravines in the northwestern part of the city. The most prominent of the ravine systems is that connected to the Don River, which empties into Lake Ontario just to the east of downtown. While the lower Don was almost wholly industrialized, much of the rest of the ravine system was not heavily affected. Branching west off the lower Don are a series of ravines that surround the neighbourhood of Rosedale, and extend further west past Bathurst Street, especially Castle Frank Brook, which extends as far as Lawrence Avenue and Dufferin Street. Located near to downtown, these are some of Toronto's most visible ravines. At an area known as the Forks of the Don, four large ravines converge as three tributaries, each with its own ravine system, merge into the main river: the West Don, the East Don, and Taylor-Massey Creek. The West Don moves from the northwest through a number of large parks, and spreads through North York creating a number of ravines that run through that area and the suburbs north of the city. The East Don contains the Don Valley Parkway for its lower stretch, but further north becomes more verdant as it moves north through the suburbs. Taylor Creek flows almost directly from the east to the Forks, with its ravine heading into Scarborough before turning north near Warden Avenue and running to St. Clair Avenue East. View of Rouge National Urban Park, a national park that includes the ravines of Toronto's Rouge Valley. Scarborough is home to two large ravine systems. Highland Creek flows into Lake Ontario at the eastern edge of the Scarborough Bluffs. It has a large watershed and a number of tributaries almost entirely confined to the Scarborough area. At the far east of the city of Toronto is the Rouge River system. Furthest away from the centre of the city, the area around it has been preserved from development by the creation of a provincial park that covers much of the river's watershed and a large network of ravines. In June 2017, the ravines along the east-end of the city was made into Rouge National Urban Park, Canada's first national urban park. In addition to the ravines that surround these four major rivers, there are a number of smaller ravines scattered throughout the city. Etobicoke Creek and Mimico Creek in the west of the city both have long valleys. In the Beaches area, Glen Stewart Ravine no longer has a visible creek, having been transformed into a popular park. The point where the Humber, Don, and Rouge River watersheds meet, in other words, the triple point of the respective watersheds, is near the intersection of Bathurst Street and Jefferson Sideroad at the Vaughan-Richmond Hill boundary. Toronto's ravines have been presented as central to Toronto's character. Architect Larry Richards describes Toronto as topographically being "San Francisco turned upside down" in reference to San Francisco's hilly terrain. They appear prominently in the works of most of Toronto's major writers such as Margaret Atwood, Anne Michaels, Robert Fulford, Morley Callaghan and Ann-Marie MacDonald. Ravines play an important background role in Atom Egoyan's film Chloe where the main characters live in a house atop the Cedarvale ravine. The unique topography of Toronto was one of the primary reasons Egoyan chose to set the film in Toronto. Fulford has stated that the "ravines are the chief characteristic of the local terrain, its topographical signature. They are both a tangible (though often hidden) part of our surroundings and a persistent force in our civic imagination. They are the shared subconscious of the municipality, the places where much of the city's literature is born." ^ Toronto, City of (4 August 2017). "Staff Directory, Divisions & Customer Service". ^ Cundiff, Brad. The Hike Ontario guide to walks around Toronto. Erin, Ont: Boston Mills Press, 1994. ^ Toronto, City of (17 November 2017). "Trees in Toronto" (PDF). ^ "The Outsiders". The Globe and Mail. Toronto. Archived from the original on 2005-01-13. ^ "National Newspaper Awards". Toronto: The Globe and Mail. Archived from the original on May 16, 2007. ^ Canada, Parks Canada Agency, Government of. "Rouge National Urban Park". www.pc.gc.ca. ^ Murphy, Mekado. "Toronto Plays Itself". Cundiff, Brad (1994). The Hike Ontario guide to walks around Toronto. Erin, Ont: Boston Mills Press. Seymour, Murray (2000). Toronto's Ravines: Walking the Hidden Country. Erin, Ont: Boston Mills Press.